The Montana Nanotechnology Facility at Montana State University (MONT) is one of 16 sites that comprise the NSF-supported National Nanotechnology Coordinated Infrastructure program. The NNCI consortium includes researchers from academic institutions, the corporate sector, and government facilities. NNCI provides access to over 2000 instruments used in fabrication and characterization of materials on the nano-scale. NNCI/MONT are responding to the National Nanotechnology Initiative (NNI) which is ".... a U.S. Government research and development (R&D) initiative involving 20 departments and independent agencies working together toward the shared vision of "a future in which the ability to understand and control matter at the nanoscale leads to a revolution in technology and industry that benefits society." See the 2016 NNI Strategic Plan to learn more about national research priorities related to nanotechnology/science. The MONT facility integrates four research centers at Montana State University: the Montana Microfabrication Facility, Imaging and Chemical Analysis Laboratory, Center for Biofilm Engineering and Proteomics, Metabolomics and Mass Spectrometry Facility. This association has enabled cutting edge research on engineeered and natural materials in all STEM disciplines (physics, chemistry, life sciences, Earth and environmental sciences, materials science, and allied engineering disciplines]. MONT welcomes new users to our facility--we can conduct initial "proof-of-concept" experiments, you can send samples for analysis, or plan to visit our facility and interact with staff to plan future research initiatives. We offer short courses for training of users of our instrumentation who aspire to work independently in our facility. For first-time users, we offer Project Initiation Grants to help get you started. Mont offers a number of public events that may be of interest to the public. Candida albicans two day-old biofilm grown on a PMMA coupon and stained with LIVE/DEAD® BacLight™ bacterial viability kit, by Alessandra Agostinho, CBE research scientist. Provenance: Image from Center for Biofilm Engineering, Montana State University; used with permission for scholarly, non-commercial purposes. 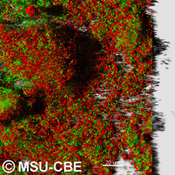 This webinar is aimed at introducing non-experts to the fundamentals of Raman spectroscopy and at those who would like to find out how a Horiba LabRAM Evolution Confocal Raman Microscope has been used in biofilm, geology, geochemistry, material science and engineering research and development projects at MSU. Examples of the application of Raman Spectromicroscopy (or Raman Microscopy in short) at MSU include surface and biofilm characterizations, mineral identification, characterizing materials and their changes (such as phase transitions), and identifying rock inclusions. It will be discussed how data obtained using Raman Microscopy and other analytical techniques can be correlated to obtain deeper insight into the properties of materials, and how Raman Microscopy might be useful in your research. The webinar is aimed at nonexperts who would like to be informed on the similarities and differences between an integrated Auger nanoprobe and a high-resolution field emission electron microscope equipped with X-ray microanalysis. Focused on the power of integrated nano-Auger for materials science with examples illustrating: imaging at nanoscale resolution; elemental information with nanoscale spectral and spatial resolution; EDX at submicron resolution; EBSD at submicron resolution; depth profiling at nanoscale resolution; elemental mapping, and chemical mapping. This webinar/seminar will offer an overview of tools and processes available in the Montana Microfabrication Facility (MMF). We'll highlight several recent and ongoing projects, explaining the deposition, patterning, etching, metrology and packaging steps used in their fabrication. By watching this webinar, you should gain a broad overview of the MMF's capabilities, the types of projects we support, and even examples of local users integrating processes from our NNCI partner sites into their workflow. We'll also discuss how to get started if you have a project idea, the costs you should anticipate, and where to find more information. This webinar reviews the application of confocal scanning laser microscopy to image microorganisms on natural and engineered surfaces. At Montana State University, this capability is housed in the Microscopy Facility at the Center for Biofilm Engineering and is supported and made available to external users through the Montana Nanotechnology Facility on the same campus. A few examples of the types of systems that are accessible to fluorescence microscopy examination include topographically modified surfaces of indwelling medical devices, microfluidic systems, and interactions between microorganisms and particulates such as precipitated minerals or corroding surfaces. Laser scanning confocal microscopy is an invaluable tool for examining biofilms because it is non-invasive, three-dimensional, allows access to multiple features or activities through the use of a panoply of fluorescent probes, and can be performed on hydrated and living specimens. This seminar will begin with basic principles and operation of the microscope and the rationale for choosing confocal microscopy as an imaging modality. The concepts of working distance, resolution, immersion medium will be explained. How these features collectively determine the depth of specimen surface topography that can be examined will be addressed. The confocals available for use in the CBE facility are Leica TCS-SP5 upright or inverted microscopes, and both include 405 nm, argon-ion (458, 476, 488, 514 nm), 561 nm and 633 nm lasers for excitation. The choice of confocal and sample configuration used are critical to successful imaging, and the factors involved in making that choice, such as imaging penetration depth and objective working distance will be discussed in detail. How fluorescent stains and probes are chosen, applied and visualized as well as techniques to improve imaging with double and triple labeling will be examined. Application topics include the following: reflection mode imaging with fluorescence overlay, which is ideal for imaging hard or reflective surfaces with attached biomass; specialized sample preparation such as agar embedding; imaging curved or irregular surfaces; and time-lapse water immersion imaging. The seminar will finish with examples of quantitative and qualitative image analysis for confocal microscopy. This webinar will introduce methods used to characterize materials (engineered and natural) using combined electron beam imaging and spectral analysis. We will introduce the concept of using the right tool for the right job. Fundamental principles will be covered together with a variety of practical applications that will include examples of imaging of particles (size, shape, morphology), composition (using back-scattered electron imaging and energy dispersive spectrometry), and surface spectroscopies to determine composition and chemical state of atomic monolayers on surfaces (X-ray photoelectron spectroscopy and Auger electron spectroscopy). This interactive forum will encourage participants to explore possible future research collaborations. This webinar is being offered through the Montana Nanotechnology Facility (MONT), a project funded by the NSF National Nanotechnology Coordinated Infrastructure program. 2019 Annual MONT meeting is scheduled for Monday June 13, 2019, afternoon. Details will be posted here when available. 2017 Join us for the Annual MONT Users Meeting, July 12, 2017, in the 407 Jabs Hall, Montana State University, Bozeman. Please register by July 10. We also invite your feedback about the Montana Nanotechnology Facility. 2016 Join us for the Annual MONT Users Meeting, July 13, 2016, in the SUB Ballroom 235 at Montana State University, Bozeman. Please register by July 8. Image from Center for Biofilm Engineering, Montana State University; used with permission for scholarly, non-commercial purposes.